The Fraternity of Phi Gamma Delta, commonly known as “Fiji,” is a college-based social fraternity founded on May 1, 1848 at Jefferson College in Cannonsburg, Pennsylvania. Headquartered in Lexington, Kentucky, Phi Gamma Delta proudly boasts 151 chapters on college and university campuses throughout the United States and Canada. With approximately 11,000+ undergraduate and over 180,000 graduate brothers, Fiji men have a profound influence throughout the world. For more information, please visit the International Fraternity of Phi Gamma Delta’s website at http://www.phigam.org. On January 19, 1900, nine men met and drew up a constitution which contained a clause officially stating the goal to gain a Phi Gamma Delta charter at Purdue University. Unfortunately, the university president at the time notified the group that their request would not be granted, as the university had banned the creation of any new fraternities on campus. However, these men had great vision and persistence. They firmly believed in the cause of Phi Gamma Delta and continued to operate under strict secrecy. Their persistence paid off. After much laborious effort, the university granted their charter. 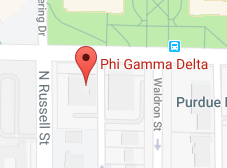 On May 30, 1902, the Lambda Iota Chapter of Phi Gamma Delta was installed. This was the beginning of many great things to come. The first chapter house was located at 417 Waldron Street, but after a very successful rush, Lambda Iota quickly outgrew the constraints of their small house. After several more moves to on and off campus residences in order to accommodate the constantly increasing number of brothers, it became clear that Lambda Iota needed a permanent home. In response to this dire need, the Alpha Graduate Chapter of Phi Gamma Delta came to out aid. They raised a substantial amount of money and paid for the construction of a new house large enough for all undergraduate brothers to occupy. On May 1, 1926, the undergraduate brothers of Lambda Iota moved into their new, luxurious home at 640 Russell Street. To this day, the Alpha Graduate Chapter exists stronger than ever and continues to support our chapter in any ways that they can – proving that Phi Gamma Delta is not for college days alone. Today, we still live at 640 N. Russell Street. Various renovations and additions have been completed within the house, and now our home can accommodate over 70 men. Throughout the years Lambda Iota has received many accolades. The Lambda Iota Chapter of Phi Gamma Delta is considered one of the strongest chapters on both the campus level and the international level. We have a proud tradition of excellence – excellence in academics, excellence in leadership, and excellence in brotherhood. Arthur G. Hanson – Former President of Purdue University and Georgia Institute of Technology. Tim Foley – Professional Football Player for the Miami Dolphins, TV Sports commentator.